Horse race betting is one of the most popular types of sports betting around the world. The exact number of money wagered on these games is unknown, but it can be safely assumed in billions of dollars. Those, who are involved in horse race betting are generally familiar with the terms associated with this game. 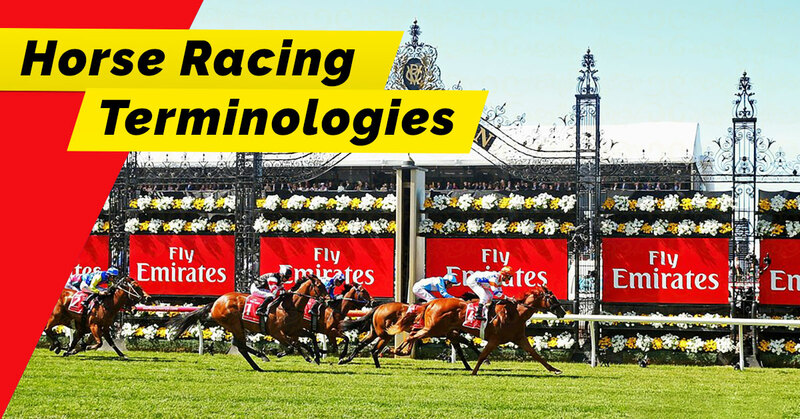 Here is a detailed guide to all the horse racing terminologies you should know about in order to be called an expert at this game. Across the Board: This is a type of bet where you can bet on the first three positions in a horse race. If your horse wins the race, you win all three bets, and so on. Action: The way a horse moves on the course is called an action. It is an important term used to decide the bet amount. Added Money: The process of adding more money to the prize money in a specific race by the track owners to entice better stables and horses in that particular game. Agent: The person who acts on behalf of jockeys and buys and sells horses in a racing game. All Out: When a horse is pushed to the highest limit in an attempt to win, it is called all out. It is usually not allowed in the game. Allowances: An allowance is a special benefit given in terms of less weight to a horse in handicap races. Allowances are usually offered to cope with bad weather and other similar conditions. Also Eligible: A substitute horse that can run in the case if the current runner is not available or is not able to run. Also Ran: The term used to refer to a horse that has run in the race but doesn’t finish at any profitable position. Apprentice: A new jockey who is not a professional. Baby Race: A race in which only 2-year old horses are eligible to run. Bald: Horses with a white face are called bald in the industry. Bar Shoe: A special rear bar shoe used by a horse when it accidentally injures its lower leg. Bay: A light tan colored horse with little brown to mahogany brown and usually some black patches is a called a bay. Bearing in or Out: The condition when a horse starts deviating from (bearing in and out of) its track either because it is tired or the jokey loses control. Bell: A bell used to mark the beginning or end of the race. Bit: A bar placed in the horse’s mouth in order to keep it in control and to motivate it. Bracer: A special oil liniment used to massage the horse to help them to relax, usually after a race. Blind Switch: When a favourite jockey doesn’t win the race because he is caught between two other jockeys before the end line such that he cannot move as he wants to. Blinkers: These are used to help the horse keep concentration on the race track and not get distracted by their environments. Board: The race board or screen where all the information relating to the race and betting odds are displayed. Bolt: A situation when a horse changes its course all of a sudden, usually because of an unplanned event. Bottom: The overall stamina of a horse is referred to as bottom. The term is also used to refer the layer of ground just below the track surface. Break: The process of breaking a horse to get a better control on it. Breakdown: When a horse gets seriously injured during a race such that it cannot race again for a long time or possibly never again, it is called a breakdown. Break Maiden: The event of a jockey or horse winning its first race. Breeze: The situation when a horse is run at a moderate speed by a jockey. Bullet: The best time achieved by horse over the same distance in a special training is known as its bullet. Bull Ring: A shorter (usually 1 mile long) version of the standard horse race track. Call: The position at which horses are at any point in time in the game is called the call. Checked: The act of a jockey suddenly stopping their horse or moving it aside for some reason is called being checked. Clerk of the Scales: This is the person who makes sure that the correct handicapped weight is assigned to every horse in a race. Climbing: It is a natural fault that is sometimes noticed by trainers in the way a horse runs. It includes acts like a horse jumping too high when running. Daily Double: The act of placing bets on two consecutive races on the same track. Dead: A term used to refer a track that is unqualified for a race. It’s usually because the track is recovering from rain or any other similar thing. Exacta: When you bet on two horse for the first and second positions by selecting the horses as well as the right order to win, it is called an exacta bet. Fast: A term used to refer a race track that qualifies for the race based on its superb ground conditions. Fence: The line that separates the racing course from the public stand. Sometimes, it is called the outside rail. Filly: A 1 to 4 years old female horse participating in the race. Firm: A term used for rating a dirt track, which is considered to be quite fast. Gate: The gates used at the start of the race. All horses are placed in their respective gates, the front of which is opened as the race begins. Good: A term to rate a racing track that stands between fast and slow. Groom: The person, also called the trainer’s assistant, who takes care of the horse in the stable. Halter: A piece of rope/leather that is put on the horse to control it and is commonly used while training a horse. Handicap: A special race where extra weight is put on horses based on their past performances, in order to even up the field for all contestants. Head: The amount by which a horse wins a race is called the head. Hurdle Race: A type of horse race where the racetrack has jumps and obstacles, including water hazards. In the Money: If a horse finishes the race in any winning position, either first, second or third, then it is in the money. Jumper: A horse that is really good at hurdle races is called a jumper. Maiden: A horse that hasn’t yet won a race is called a maiden. Muzzle: An apparatus placed over the horse’s mouth in order to prevent it from eating things it isn’t supposed to eat. Oaks: A race consisting of only 3-year-old fillies. Off-Track Betting: An off-track betting place is a location where you can go to make wagers on a race that is happening someplace else. On the Board: Any horse that finished in the top four after a race will be on the board. Generally, these horses are the ones that give you money. On the Nose: The term used to refer the act of betting on a horse to win the race. Paddock: The race track area where horses are prepared for the race. Pari-Mutuel: A betting pool that is formed with the combination of all the money wagered on a specific race. The payouts are determined depending on the nature, value, and popularity of the bets. Photo Finish: When after a race, the winner is not clearly known, it is identified by showing a series of photos captured during the race. Place: When you bet on your horse that it will finish either first or second, it is called a place bet. Post: The starting position in a horse race is called the post. Purse: The total prize money for a specific race which is contributed by the race owner and organizers is called the purse. Saddle Cloth: The cloth placed under the saddle of a horse in order to protect it from the hard saddle. The saddle cloth also displays the horse number for the race. Scratch: The act of a horse withdrawing from the race is called a scratch. Show: A bet that the horse will finish third or better than that. If the horse finished at the third position, it is simply called a show. Sophomore: A horse, of either gender, that’s three years old. Stakes: A type of horse race in which participants (horse owners) have to pay a fee in order to enter the race. Trifecta: A bet that is placed on the first three horses in any race, mentioning the horses and the winning order. A box trifecta bet is a variant where the three horses you bet on can finish in any order for you to win. Whip: It is used by jockeys to control a horse during the race. It is also sometimes referred to as a stick.